You’ve peeked at your horoscope for insights into your relationships and career–why not let your astrological sign lead you to your ideal drink, too? Besides, every great party needs a memorable party trick, and this could be yours! 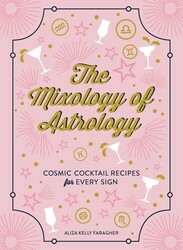 So sit back, relax, and let Aliza Kelly Faragher, author of THE MIXOLOGY OF ASTROLOGY and Allure magazine’s go-to astrologer, help you discover your perfect cocktail based on your star sign. Is there any beverage more quintessentially Aries than a Spicy Margarita? Even without the added heat, Margaritas mirror the archetypical Aries spirit: they’re iconic, playful, and are known to induce untamable rowdiness. With added spice, however, Margaritas get an extra dose of fabulous. Taureans are the foodies of the zodiac, and these gourmands know the bacon craze is well founded: bacon’s distinctive savory essence adds delicious complexity to a wide variety of dishes. Now Taurean bacon-lovers can expand their horizons even further: behold, the Bacontini! Though a bit eccentric in both name and presentation, the Bacontini is an incredibly scrumptious libation that indulgent bulls will absolutely adore. Gemini are all about duality (the sign is, after all, symbolized by the twins), making the Black Velvet the perfect cocktail for this dynamic air sign. The beverage is simple (half stout beer, half champagne), but the taste is complex. The Black Velvet effortlessly combines lowbrow and highbrow alcohols in a single glass, creating a uniquely fruity, creamy, and bubbly flavor profile. Gemini will enjoy the drink’s distinctive flavor, as well as the sheer novelty. Represented by the crab, Cancers love spending time by the shore. In fact, these celestial crustaceans are most deeply connected to their innate psychic abilities when near water. The Yaka Hula Hickey Dula is the perfect tropical cocktail for Cancers, effortlessly capturing the mellow beachside vibes that Cancers so deeply crave. These celestial lions are the most theatrical sign of the zodiac, and their larger-than-life personalities are perfectly suited for dramatics performed over a glowing crystal ball. The Fortune Teller cocktail is the ideal accessory for aspiring Leo starlets. Though it can’t promise clairvoyance, after a few sips, Leos will surely be glowing. Bonus: Learn how to make the Fortune Teller in the video below! The Paloma (Spanish for “dove”) is one of the most popular cocktails in Mexico. Virgos will love cooling off with this invigorating beverage, and will also enjoy preparing this succulent cocktail. Boasting accessible ingredients and a straightforward recipe, the Paloma is guaranteed to become one of Virgo’s go-to favorites. Plus: Watch the video below to learn how to whip up this cocktail! Symbolized by the scales, Libras aspire to create equilibrium in all areas of life. The French 75 exquisitely balances both beauty and substance, making it the ideal cocktail for symmetry-focused Libras. On the outside, the French 75 is elegant and alluring…. The drink itself, however, is not for the faint of heart: this potent concoction packs a serious punch. In fact, one sip feels like being shelled in the gut by a French 75 mm cannon—a comparison that inspired its iconic name. Libras will adore this poised elixir that perfectly epitomizes harmony. Scorpios will love this timeless “hair of the dog” cocktail. Though early iterations of the uplifting Corpse Reviver date back to the mid-1800s, the recipe that is still enjoyed today was first printed in 1930. The cocktail was prescribed “to be taken before 11 a.m., or whenever steam and energy are needed.” Ghoulish Scorpios will delight in this pungent concoction that is sure to wake the dead. Adventurous Sagittarians love to travel. These fire signs project their arrows into faraway lands, inspiring the passionate archers to go the distance. Whether by plane, train, automobile, or even cross-country bus, Sagittarians are always ready to begin a new quest. Efficient and direct, the Greyhound cocktail is quick and easy to prepare, making this the ideal beverage for Sagittarians on the move. Capricorn symbolizes the father, making the Godfather a perfect drink for this parental sign. Comprising only two ingredients— scotch and amaretto—the Godfather is easy to prepare. This straightforward blend creates a rich and smooth flavor that earthy Capricorns will adore. Whether sipped during happy hour or as an after-dinner digestif, the Godfather will channel Capricorn’s inner Don Corleone. Let’s face it—Aquarians enjoy proving people wrong. In fact, debunking is one of their favorite pastimes. This summer, Aquarians will love sipping on the Gin Rickey—a classic gin-based cocktail defined by its zesty fizz. The drink was concocted specifically to provide maximum cooling effects, distinguishing it from the Gin and Tonic, which was initially created to prevent malaria. Aquarians will love this delicious cocktail that is served with an unexpected narrative. Thirsty for more? 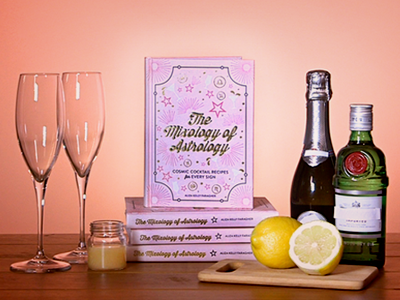 You can find the recipes for these drinks and ALL the drinks that match each star sign by picking up a copy of THE MIXOLOGY OF ASTROLOGY. And for another example of the power of your star sign, read on to see how the universe affects your everyday life. Excerpted from The Mixology of Astrology by Aliza Kelly Faragher. Copyright © 2018 by Simon & Schuster, Inc. Used by permission of the publisher. All rights reserved. Share Find Your Perfect Cocktail Based on Your Star Sign!